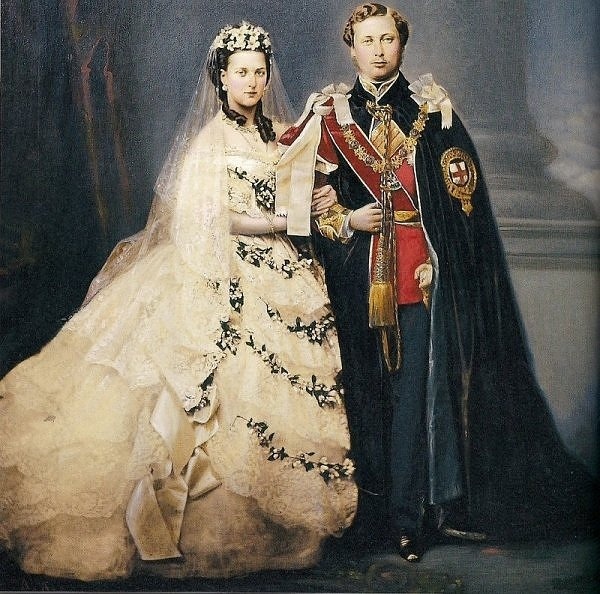 In this post, the first of the two part series on Royal Wedding Dresses, I will start with Queen Victoria who married Prince Albert in 1840 through to the Duchess of Windsor who married the Duke of Windsor in 1937. The Duke, the former King Edward VIII, had abdicated in 1936 amid scandal and disastrous worldwide publicity. 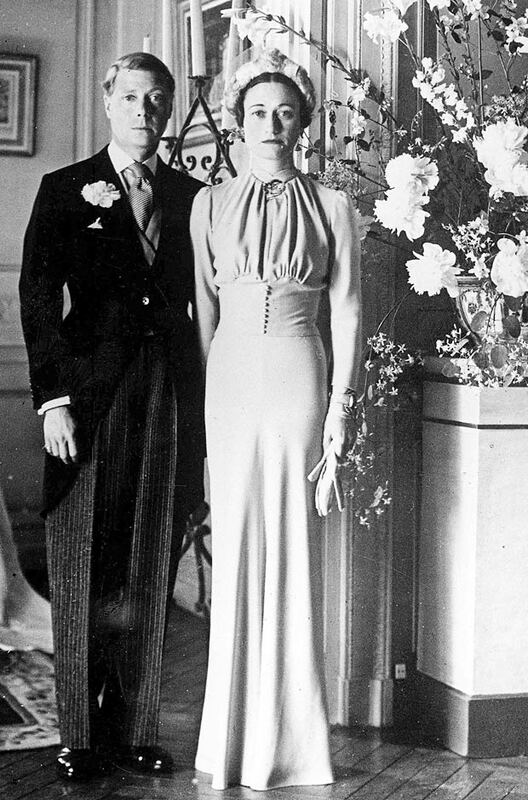 I know normally Wallis Simpson is not included when discussing the British Royal family but she was known for her great fashion style and for this reason there is a brief description of her wedding dress at the end of this post. 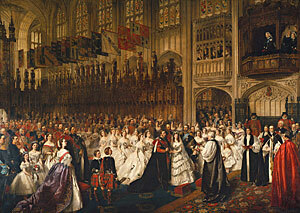 Queen Victoria married Prince Albert of Saxe-Coburg-Gotha on February 10, 1839 in the Chapel Royal at St. James Palace. It has been said that Queen Victoria started a bridal custom of wearing a white or ivory wedding gown. Prior to that time royal brides wore elaborate dresses made especially for the occasion from gold or silver fabric sometimes embroidered with silken threads and embellished with semi-precious stones to show their wealthy status. Ordinary brides of the working class wore their “best dress” usually made in a dark and durable material. 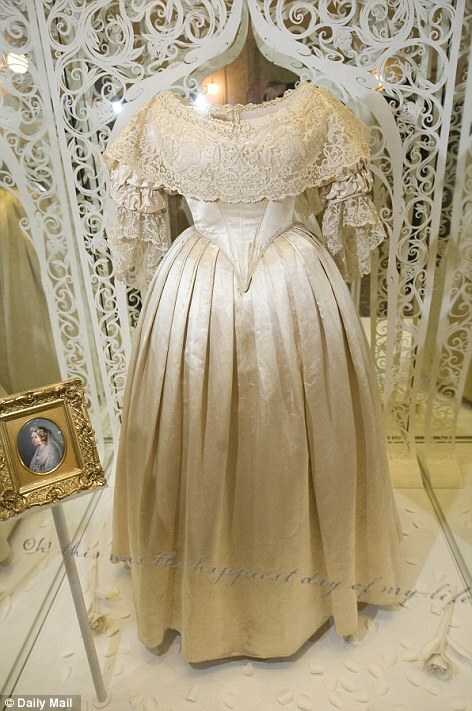 Queen Victoria wore a white satin dress which featured a separate bodice top and a full skirt. 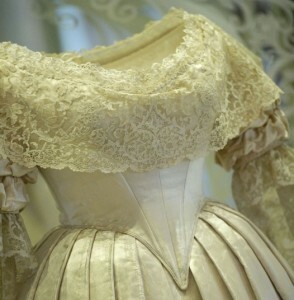 The bodice had a round neckline with a pointed waist decorated with piping and short full sleeves trimmed with Honiton lace that gathered into double puffs. The skirt was gently gathered at the waist into deep pleats and featured a court train that measured 18 feet in length that had a border of orange blossom sprays that matched the head wreath that Queen Victoria wore on her head to secure a square Honiton lace veil. Orange blossoms were a wedding tradition often worn to symbolize fertility and purity. Royal Note: Queen Victoria continued to wear her bridal veil long after her wedding day and she wore it for the christenings of her nine children with the exception of her eldest son, Prince Albert (later King Edward VII), when she wore her Garter robes to mark the grand occasion of the christening of the heir to the British throne. She also wore it for the marriage ceremonies of two of her children, eldest daughter Victoria’s wedding in 1858 and her youngest son Leopold’s wedding in 1882, and also for the wedding of her grandson George’s (later King George VI) wedding in 1893. 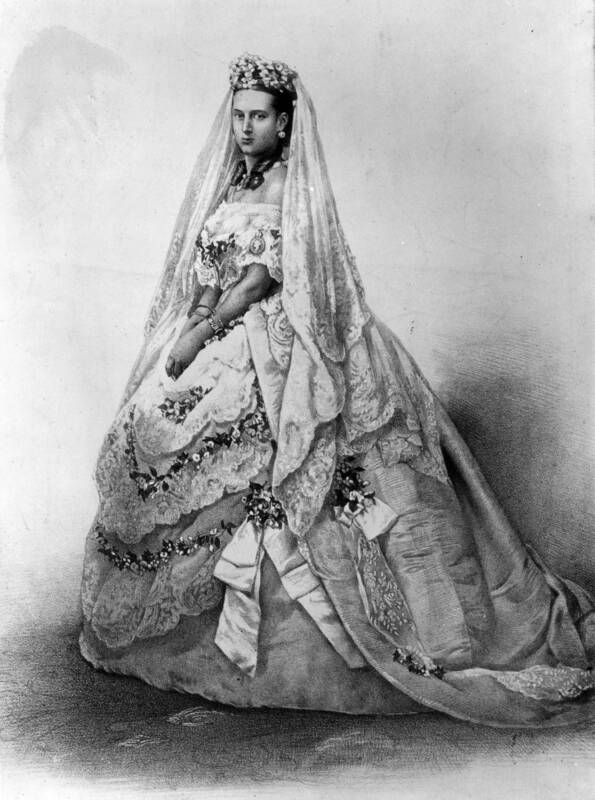 Queen Victoria’s youngest child, daughter Princess Beatrice, was given the distinct honor of wearing the Queen’s bridal veil for her own wedding in 1885. Queen Victoria wore her bridal veil one final time in 1897 for her official photograph on the occasion of her Diamond Jubilee and when she died in 1901 her request was to be buried with her wedding veil. To complete her bridal ensemble, Queen Victoria wore a necklace and earrings set made from Turkish diamonds. In 1838, almost two years prior to her wedding, the Queen received several diamonds as a gift from the Sultan of Turkey. These diamonds were made into a necklace and earrings set by the Royal Jewelers, Rundells and Bridge. The necklace features several diamond rosettes on a strand made of even more diamonds. The earrings were made in a similar style and were considered quite heavy to wear. Records indicate that upon her death in 1901, the set was given to her son, the Duke of Connaught. Unfortunately, the set is no longer a part of the Royal Collection and has since disappeared with its whereabouts unknown. Special Note: Queen Victoria’s wedding gown is preserved and is now part of the British Royal collection and was most recently put on display at Kensington Palace in 2012. It is doubtful as to whether the dress will be further exhibited due its fragile condition. The wedding dresses of the additional Royal brides mentioned in this post, with the exception of the Duchess of Windsor’s dress, are also part of the British Royal collection which were also displayed at Kensington Palace in 2012. Hopefully, these historical fashions will be exhibited again in the near future. Princess Alexandra of Denmark married Prince Albert the Prince of Wales (later King Edward VII) on March 10, 1863 in St. George’s Chapel at Windsor Castle. At the time the Royal court was still in mourning after the unexpected death of Queen Victoria’s husband, Prince Albert in December 1861. The strict rules that dictated the mourning customs of the time meant that the royal court was required to wear shades of grey, lilac or mauve. 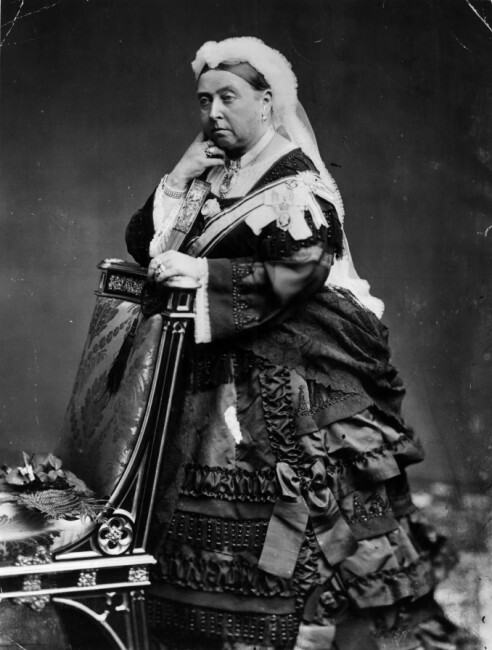 Queen Victoria, who was devastated by the death, wore a black dress for the wedding and wearing black is something that she continued to do for the remainder of her life. She also refused to take part in the ceremony and watched from a secluded area in the St. George Chapel. The exception to the mourning custom was the elaborate ivory silk taffeta wedding gown worn by the eighteen year old bride, Princess Alexandra, which was made by Mrs. James who worked out of her design studio in Belgravia. The dress featured a separate bodice top and a full skirt which had an overlay of Honiton lace with a design that incorporated roses, shamrocks and thistles designs which were symbols of England, Ireland and Scotland. The skirt featured a 21 foot train of antique silver moiré which was carried by the eight bridesmaids as the Princess entered St. George’s Chapel on her wedding day. The dress was also trimmed with orange blossoms and the Princess also wore a white Honiton lace veil that was secured on her head by a wreath of orange blossoms and myrtle. To complete her bridal ensemble, Princess Alexandra wore a diamond necklace and matching earrings which were complimented by a pearl and diamond brooch worn on the bodice of her wedding dress. The jewelry was presented to her before her wedding day as a gift from her husband, Prince Albert the Prince of Wales. The Queen gave her an opal and diamond bracelet. 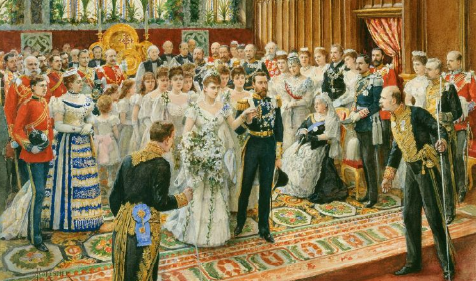 On July 6 1893 Princess Mary of Teck married Prince George (later King George V) in the Chapel Royal at St. James Palace. Princess Mary had been previously engaged to Prince Albert, the brother of Prince George. Sadly, Prince Albert died suddenly of pneumonia on January 14, 1892 and, concerned about the line of succession, Queen Victoria strongly encouraged her grandson, Prince George, to marry his deceased brother’s former fiancé who the Queen had become very fond of. Because Prince Albert had died only a few weeks before their anticipated wedding, Princess Mary had already had her dress made and obviously after the tragedy, due to the emotions involved, it could no longer be worn. After a period of mourning, Princess Mary and Prince George had spent an increasingly amount of time to together grieving the loss of Prince Albert. The Royal couple soon fell in love, became engaged and a wedding date was set. Of course, a new bridal dress was needed and one was created by British designer Arthur Silver. On her wedding day, Princess Mary wore an ivory silk satin dress accented with a design of roses, shamrocks and thistles in silver thread. 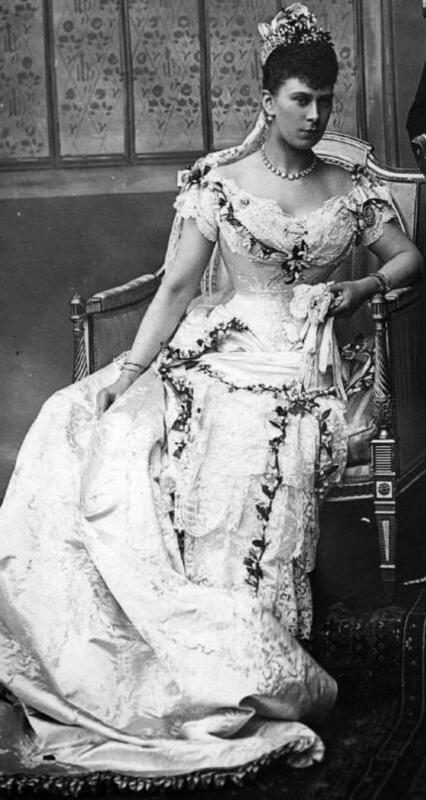 In keeping with the tradition set by Queen Victoria and later by Princess Alexandra, the entire bridal dress was made by English manufacturers. The dress also featured Honiton lace and garlands of orange blossoms. The Princess wore a small veil made of Honiton lace which was borrowed from the bride’s mother, Princess Mary Adelaide the Duchess of Teck, and had been worn previously on her wedding day in 1866. To attach the veil to the back of Princess Mary’s head a set of diamond Rose of York pins were used to secure it in place, the generous gift from Queen Victoria. To complete her bridal ensemble the bride also wore a diamond necklace from Prince George’s parents, the Prince and Princess of Wales and a diamond tiara from Queen Victoria and finally diamond earrings and brooch from her groom, Prince George. Lady Elizabeth wore an antique ivory veil made of Flanders lace veil and secured in place on her head with a simple wreath of myrtle leaves with a cluster of white York roses and white heather positioned on either side of her head. The veil was presented to the bride from her future mother-in-law, Queen Mary, to wear on the wedding day. For the bride’s “something old”, a piece of Brussels lace said to be a Strathmore family heirloom, was added to the wedding dress. 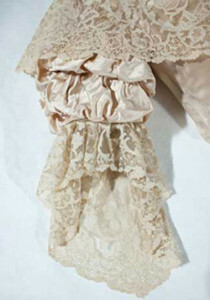 The lace had been originally used on the ballgown of a relative. To complete the bridal ensemble, Elizabeth’s shoes were made from ivory silk moiré and embroidered with silver roses. 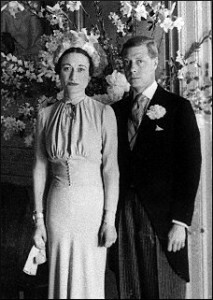 In less than a year after his abdication, the exiled Edward the Duke of Windsor married Wallis Simpson on June 3, 1937 at the Château de Candé located in France. Wallis had always been known for her high fashion style and her bridal dress was destined to became one of the most photographed and most copied dresses of that time. The designer of the dress was an American named Main Rousseau Bocher, who became known in the fashion industry as Mainbocher, and he was working in Paris at the time of the marriage. Since this would be the Duchess’ third and final marriage, the dress was made in a beautiful light shade of periwinkle blue. It has been said that the color was specifically chosen to match the Duchess’ eyes and it would later become her signature color called “Wallis blue”. The bridal dress was made of silk crepe and featured a long slim skirt that slightly flared at the bottom and a long sleeve jacket with a high collar, soft gathering below the bust line and a button closure. To continue the four part series about the British Royal Weddings, this post will discuss the weddings of two future Kings of England. The two weddings took place almost 30 years apart and both took place shortly after two tragic deaths in the British Royal family. The first one was the wedding of Queen Victoria’s oldest son, Prince Albert Edward (later King Edward VII) which took place 15 months after the death of his father. The second one was the wedding Prince George, the son of King Edward VII and heir to the throne of England, who married Princess Victoria Mary of Teck (later Queen Mary). She had been previously engaged to Prince George’s older brother, Albert, who had died rather quickly suddenly from pneumonia in 1892. The wedding of Prince Albert and Princess Alexandra came while the Royal court was still in mourning after the unexpected death of Queen Victoria’s husband, Prince Albert in 1861. The strict rules that dictated the mourning customs of the time meant that the royal court was required to wear shades of grey, lilac or mauve. Queen Victoria, who was devastated by the death of her husband, was in deep mourning for the loss of her beloved husband, and she wore a black dress for the wedding, wearing black was something that she continued to do for the remainder of her life. She also refused to take part in the ceremony and watched from a secluded area in the St. George Chapel. Albert and Alexandra were introduced by his sister in September 1861, but unfortunately Albert was only mildly interested. At the time, Albert had been in military training in Ireland with the Grenadier Guard and he had become romantically involved with an Irish actress named Nellie Clifden. Albert had moved onto his studies at Cambridge University and the scandalous news was starting to circulate in the royal court. His father became aware of the disastrous situation and eventually confronted Albert about his improper behavior. It has been said that while father and son took a long walk in the rain along the streets of Cambridge discussing the situation, his father became gravely ill afterwards and died a short time later. For this reason, Queen Victoria blamed her son for causing the death of her beloved husband. Although, much later it was proven that he had been suffering from chronic long term stomach problems (possibly abdominal cancer) which were further compromised by his heavy workload causing severe fatigue. The wedding day for Prince George and Princess Mary was unusually hot but once again the British public gathered along the parade route. Queen Victoria arrived ahead of the bridal couple dressed solemnly in a black satin dress and wearing the white wedding veil that she had wore on her own wedding day many years earlier, she also wore her unique small diamond crown. After leaving her carriage she slowly walked the aisle with the aid of a cane to take her seat at the front of the Royal Chapel. The groom, Prince George arrived dressed in his naval uniform with his almost identical looking cousin, the Tsarevich Nicholas of Russia as well as his father, Prince Albert and his uncle, the Duke of Edinburgh. The bride, Princess Mary arrived with five children attendants and five bridesmaids. The bridal party proceeded down the aisle to the music of Lohengrin and the Archbishop of Canterbury performed the ceremony. Afterwards, the bridal couple kissed Queen Victoria and then proceeded through the streets of London and back to Buckingham Palace for a bridal luncheon. On her wedding day, Princess Mary wore an ivory silk satin dress with a long train. The dress was accented with a design of roses, shamrocks and thistles in silver thread and, in keeping with the tradition set by Queen Victoria and later Princess Alexandra, the entire bridal dress was made by London manufactures. The dress also featured Honiton lace and garlands of orange blossoms. The Princess completed her bridal ensemble by wearing a small veil that was previously used by her mother, Princess Mary Adelaide the Duchess of Teck, on her wedding day in 1866. For the wedding ceremony, the Princess carried a bridal bouquet made entirely of white flowers. The bouquet included the “York” roses, orchids, lilies of the valley, carnations, orange blossoms and of course the traditional springs of myrtle. There is a charming story that on the morning of their wedding Prince George had a glimpse of Princess Mary who he saw in the distance at the end on a long corridor in Buckingham Palace. The Prince gallantly bowed to the Princess and this sweet memory was remembered and cherished for their long lifetime together. After the wedding, the newly married couple spent their honeymoon at Sandringham which was the Norfolk estate of the groom’s father. 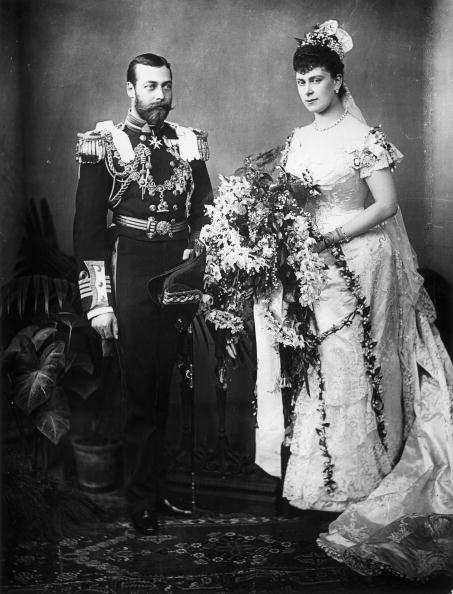 Despite the unusual beginning of their romance after the death of Prince Albert, the couple grew to be very fond of each other and their marriage proved to be a very successful one. For more information about additional British Royal Weddings, please click of the following links: Part One – Queen Victoria and Prince Albert. 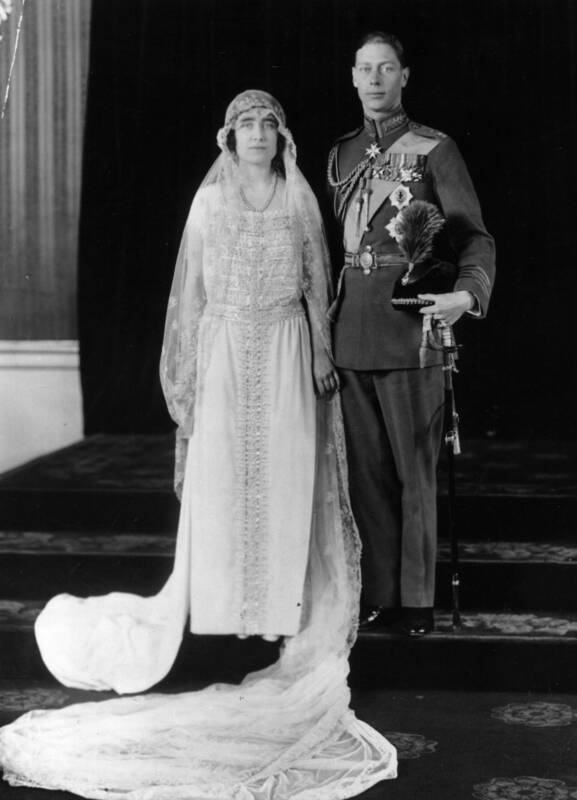 Part Three – Prince Albert (later King George VI) to Lady Elizabeth Bowes-Lyon and Princess Elizabeth (later Queen Elizabeth II) to Prince Phillip. Part Four – Prince Charles to Lady Diana Spencer and Prince William to Catherine Middleton.